I love this dish. The idea came to me on the walk home from the gym when I needed a quick, protein-packed dish that could cook on its own while I took a shower! I had less than an hour to eat, shower, and head back off to class, so those were the rules my lunch had to live by. Black beans and quinoa seemed like the perfect combination. There was some trial and error the first few times I made it. I cooked the quinoa separately and added it to the bean mixture at the last minute, but that left the quinoa too flavorless, and the beans too dried up. Next, I tried cooking the quinoa with the beans, but left the lid on like you normally do with quinoa. It puffed up just fine, but there was too much liquid leftover that had to cook off in additional time. I’ve also added bacon to it before. Crisped up the bacon, then crumbled it and cooked the veggies in the bacon fat. You can add the bacon on top for a salty, delicious crunch. But, the bacon is also extra time (and money! ), and I’ve found that it’s perfectly fine without. 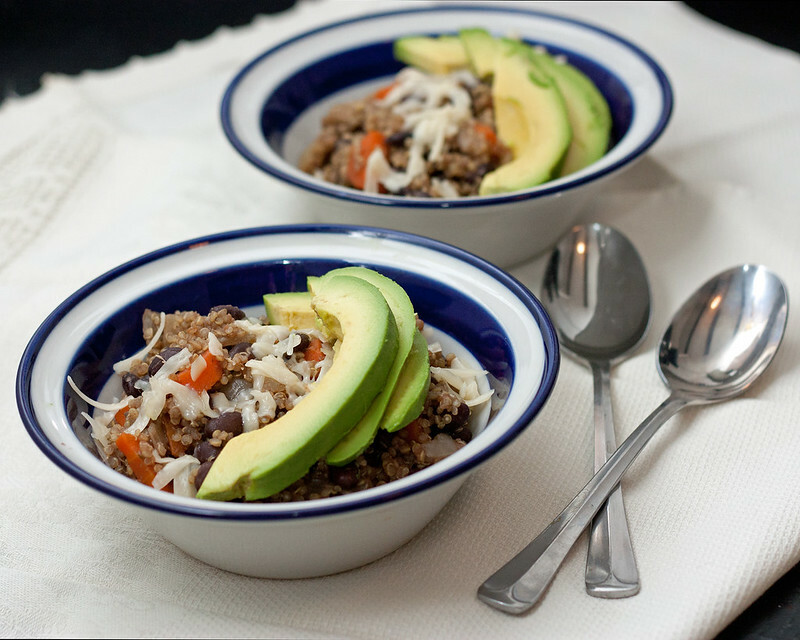 Mexican black beans and quinoa is one of those dishes that tastes great right when you make it, but sitting in the refrigerator over night makes magical things happen to the flavors. I highly recommend making some at night and eating it for lunches during the week! You’ll be feeling happy and energized all afternoon. So, what have we learned from all this? 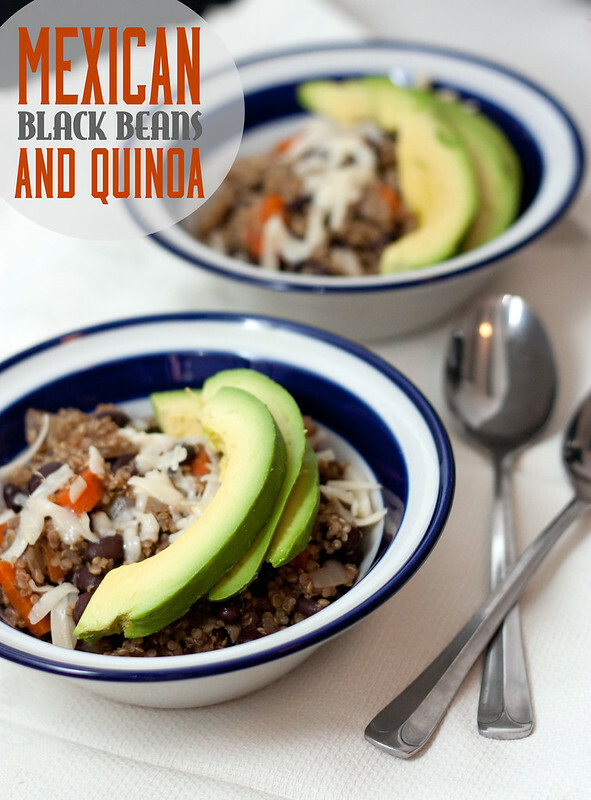 Mix the quinoa with the black beans, cook with the lid off, bacon or no bacon, perfect for lunch. Now can we dub Mexican Black Beans and Quinoa a one-pot wonder? Yep, a one-pot wonder. Heat the olive oil in a medium pot over medium heat. Add the onion, carrots, and spices, stirring to combine. Cook until onions are just softening, about 3 or 4 minutes. Add the black beans, quinoa, and stock, and increase the heat to high. Bring to a boil, then reduce to a simmer. Cook, uncovered, until all the liquid is absorbed, about 20-25 minutes. Top with avocado and cheese, and maybe some hot sauce! Enjoy! I made this for dinner tonight with some small changes: added red bell pepper, doubled the recipe, used weird non-dairy/lactose/casein(I don’t even know what that is!) instead of mozzarella because I accidentally grabbed the wrong bag at the market. Ended up taking a little longer to cook the quinoa, and I ended up cooking it with extra liquid and the lid on since it was taking a long time. Oh, and I added cheddar at the end. Love me some cheddar. And a different spice blend. But overall, a fantastic meal. Stick to my skinny bones, which I needed tonight, and was a great quick(ish) meal. Can’t wait to hear about Asia. I made this tonight but because of the ingredients I had used: black beans, green onions, garlic, EVOO, paprika, coriander powder, cumin, and at the in stirred in fresh chopped cilantro and the juice of a half of a lime. It was a big hit thanks for the idea!